I understand that DVDs have been dropping through the letterboxes of major dealers of antiquities in the last few days. They contain images of objects originally seized in Zurich in 2001; they were later released by a judge. In another legal ruling the Carabinieri have been granted permission to reseize the objects - but key pieces have been dispersed. The Carabinieri are now distributing images of the 350 or so items that have been passed on by the dealer concerned. You really should view the DVD if you have bought any antiquities in the last few years without a recorded collecting history, especially if it came from "an old Swiss collection". 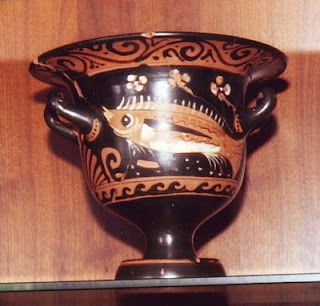 And if you recognise this krater please do let the Carabinieri know ... or leave a comment. All this is a reminder of how the Italian authorities are tackling the problem of looting. Auction-houses could be advised to stop selling antiquities that do not have documentation to show that they surfaced prior to 1970. Do you know whether the images are available anywhere online?